Despite hosting an international asbestos conference in 2003, Slovenia remains mired in a philosophy of don't know, don't care when it comes to safeguarding workers and the public from hazardous exposures to asbestos. There are multiple examples of ill-considered and illegal asbestos removal practices occurring in public and private enterprises. 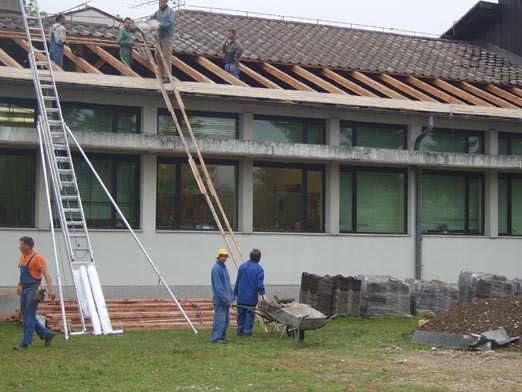 In August 2006, Slovenian TV documented a licensed company removing pieces of an asbestos roof from a primary school as children attended kindergarten inside the building. The headmistress denied that the children had been placed in danger. A few weeks ago a similar incident took place during refurbishment work by an unlicensed company at an elementary school close to the capital, Ljubljana. Photographs illustrating the hazardous working practices at the site were published causing great concern to the parents and the community. The headmistress and mayor of the municipality shifted the blame onto the contractors who had, so they maintain, been advised that asbestos could be present. The contractors responded that they were only taking a sample of the roofing material in order to assess the state and composition of the roof to avoid further complications; the sample they took consisted of more than half of the school's roof. In recent months there have been nine articles by journalist Anuska Delic in Delo (Work), Slovenian's most popular daily newspaper, on the subject of asbestos in the Central Workshops of Slovenian Railways (CWSR), an enterprise owned by the government, and tasked with repairing, renovating and refurbishing the country's railway rolling stock. Statements provided by CWSR spokespeople to Delic and to TV interviewers about on-going asbestos exposures in the Ljubljana workshops have been neither fulsome nor consistent. According to the CWSR, as of 2005, there were 308 railway cars and locomotives in use which contained asbestos; as of January 2007, this figure had, purportedly, been reduced to 200+ each of which contained 10-1050 kilograms of asbestos per car. The asbestos content of contaminated passenger cars is estimated at 180-400 kilograms of asbestos-containing insulation, amongst the most friable and dangerous of all asbestos products. Considering that the majority of the rolling stock was built during a time when the use of Soviet asbestos was ubiquitous (1962-1985), the continued use of such out-dated and polluted vehicles indicates a blatant disregard for occupational and public health. Government officials have either been blind to the health hazard this constitutes or complicit in purposefully ignoring it. The first mention of the asbestos hazard in Slovenian railways to appear in the annual reports by the State Workplace Inspectors did not occur until 2004; this entry consisted of 2 sentences on the subject. In a recent TV interview, a CWSR spokeswoman denied that the asbestos product present in the Slovenian rolling stock was of the friable sort, claiming it was a hard type of asbestos product, i.e. one which did not easily break. The presence of asbestos in these cars did not, she said, pose a danger for the workers, passengers or people waiting at railway stations. As far as can be ascertained, the CWSR's claims that all the exposures are within permitted limits are ill-founded; there is no proof that the company has ever sampled asbestos fiber concentrations at train stations. Before 2006, the only medical supervision received by at-risk CWSR workers consisted of X-rays taken during the course of periodic physical examinations at the railway medical center. In 2004-5, some workers underwent CTs, paid for individually, to establish whether or not there had been any changes to their lungs. The first time the company paid for employees to receive examinations by specialists was in 2006, at which time 100 CWSR workers were chosen at random and sent to the Pulmonary Hospital in Golnik for medical check-ups. In 2007, 120 more workers were tested. Considering the fact that there are 1,100 workers at this facility, 80% of those at-risk have, as yet, received no appropriate medical attention. At the current rate, it will take until 2015 before all the workers have had their initial CTs; the issue of periodic follow-ups for those already tested has not even been considered. In an atmosphere where medical attention is dependent on a whim of one's employer, it is not hard to understand why most of the employees at the railway works are too frightened to talk.